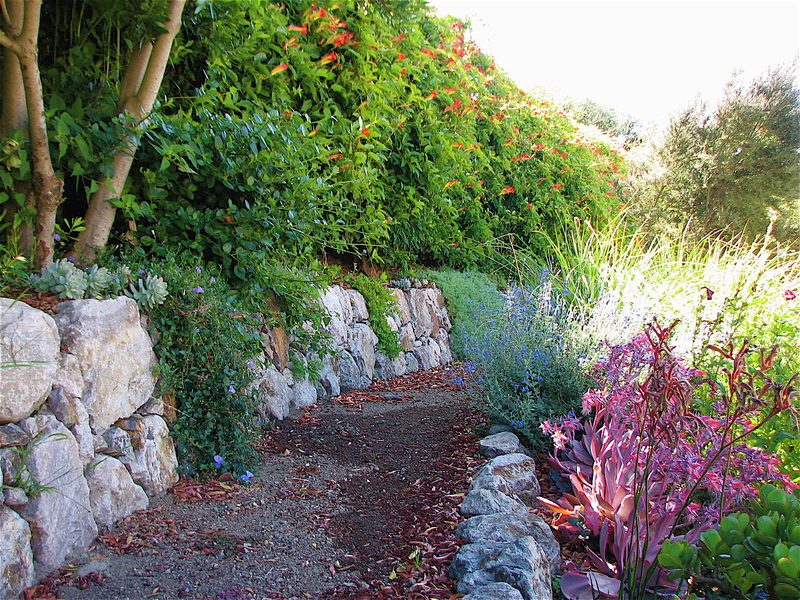 Lots of foliage color and texture add interest to this drought tolerant garden. Fence by other. White stone contrasts with blue chalk sticks (Sencio serpens). Drought tolerant red hot pokers (Kniphofia) add color to this hot hillside. This planting was selected to soften the retaining walls. Diverse foliage color adds interest. Phorimium Guardsman is a strong upright grower reaching 8ft or more. Diverse planting creates interesting containers. Senisio mandraliscae is planted with stone to give the feeling of water in this drought tolerant landscape. Deer-proof planting with color and texture.